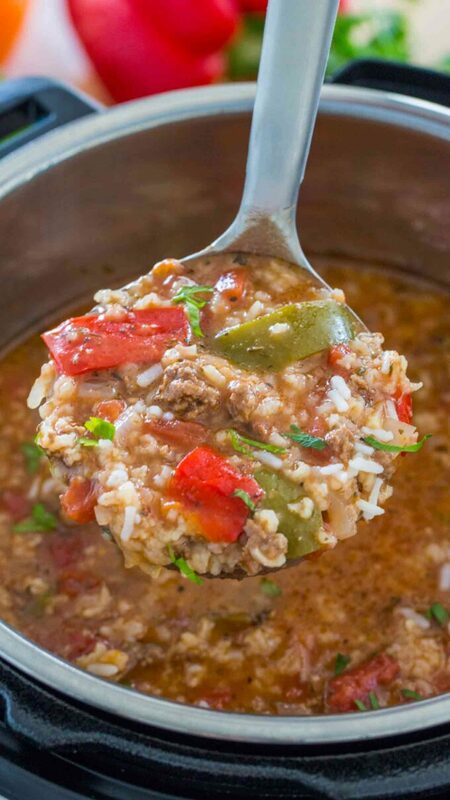 Instant Pot Stuffed Pepper Soup is hearty and delicious, the best part is that you don’t have to pre-cook the rice. The soup is ready in about 30 minutes. Soup Recipes are my favorite to make in the Instant Pot. 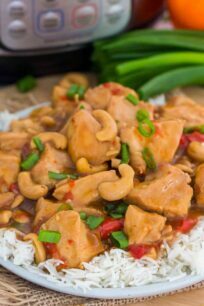 Usually, they are the easiest and take less time and effort than the same recipe on the stove or slow cooker. I love making Stuffed Peppers in the pressure cooker and in the oven, and this soup is perfect for when you want the same flavors, without all the extra effort. 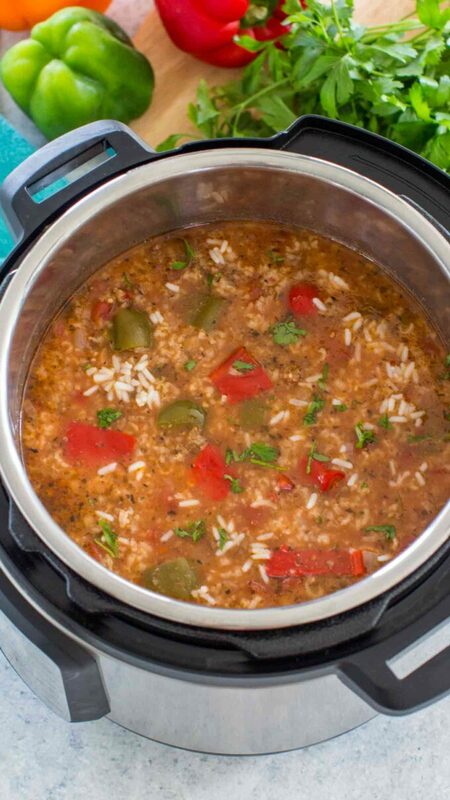 You should also try my Instant Pot Lasagna Soup and the very tasty Ham and Bean Soup. Instant Pot Stuffed Pepper Soup is such a comforting meal you can make in just about 30 minutes in your electric pressure cooker. My favorite part is that after you brown the beef, you basically dump the rest of the ingredients and cook. 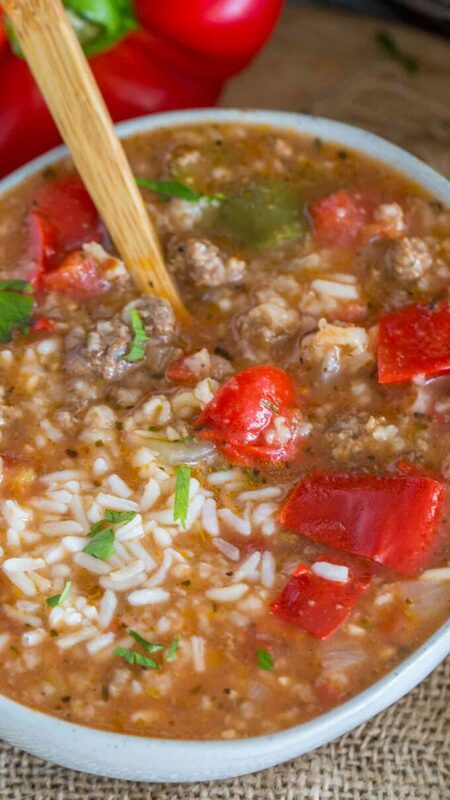 This hearty soup is made with browned ground beef, rice, bell peppers, tomatoes, and dried herbs. It tastes like a delicious stuffed pepper, without all the hard work. Serve topped with a dollop of sour cream and a sprinkle of mozzarella or parmesan cheese. 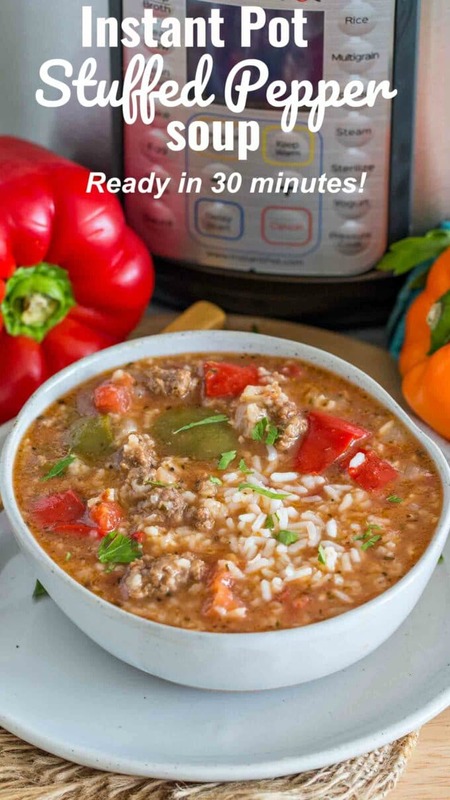 How long do you cook Instant Pot Stuffed Pepper Soup? This is one of the quickest and easiest recipes you can make in the pressure cooker. It is cooked in only 4 minutes on High Pressure, followed by a 10 minutes natural pressure release. If you already have cooked rice on hand, this is the perfect method for you. Also, if you choose to go this route, your rice will taste perfect, as it hasn’t been soaked in liquid. Follow the recipe directions and brown the beef, sauté the onion and garlic. Add all the ingredients per recipe directions, but skip adding the rice. Use 1-2 cups less of liquid, than what the recipe asks for. Depends how thick you want the soup. Cook the soup for 4 minutes on HP with a 10-minute Natural Pressure Release. Stir in the cooked rice into individual bowls, right before serving. If you don’t have cooked rice on hand and would prefer to not dirty another pan, this method is for you. Also, this works great if you are looking to make the recipe in one pot and very quickly. The rice won’t be as perfect in texture, but it will still taste delicious. Add all the ingredients per recipe directions including the uncooked rice, preferably you should rinse it before you add it to the pot. Use leaner beef, or you can also use ground chicken, ground turkey, ground Italian sausage. Adding some bacon to cook with the beef will add an amazingly rich flavor to the soup. Adding dry herbs, like thyme and oregano, will add more flavor. Rinse the uncooked rice before adding it to the soup. If you intend on freezing this soup, I recommend you do do NOT cook the rice with the soup. As if you freeze it with the cooked rice in the soup, once you thaw it, the rice texture will be affected. Cook the soup using the “cooked rice” version, which means you don’t add the uncooked rice to the pot, but rather add cooked rice to the liquid before serving the soup. I recommend using quart bags to freeze this soup. Use a cup to transfer the soup from the pot into the bag. Squeeze out excess air and seal the bags. The bags can nicely be stored in the freezer for up to 3-4 months. Heat in a soup pan, simmer for a few minutes. Stir in cooked rice into individual bowls right before serving. 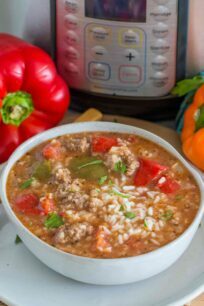 Instant Pot Stuffed Pepper Soup is hearty and delicious, the best part is that you don't have to pre-cook the rice. The soup is ready in about 30 minutes. Select Saute from the Instant Pot menu, and wait for it to read Hot. Add olive oil to the pot, and add ground beef. Cook unmoved for 1 minute, to get a nice sear on it, this will add extra flavor. Using a wooden spoon break the beef and cook until no longer pink, stirring often. This will take about 4 minutes. Add the diced onion, minced garlic, Worcestershire sauce, dried oregano, dried thyme, Italian Seasoning, red pepper flakes, salt, pepper and uncooked rice if using. Stir to combine and cook for 1 minute. Note: if using cooked rice, you should NOT be adding it to the pot. Add the rest of the ingredients: tomato paste, tomato sauce, diced tomatoes and bell peppers. Add beef broth or chicken broth and stir to combine. Cover with the lid and lock it. Point knob to sealed and cook for 4 minutes on High Pressure, followed by a 8 minutes Natural Pressure Release. Release manually the remaining pressure. Open the lid and stir. If you are using cooked rice, add the soup to bowls, and stir in cooked rice individually into each bowl right before serving. If you added the rice to the soup, once you refrigerate it, the rice will absorb more liquid and will also change in texture a bit, becoming softer. When reheating it, add more broth or water to it. Simmer for 1 minute. I love making dishes like this when fall and winter roll around. They’re so yummy, and they freeze well. That means I can make enough for an army and have premade dinners ready to go! This combines two of my favorites – stuffed peppers and the Instant Pot. I love the idea of making an easy soup that has all the flavors of stuffed peppers but it so much easier to eat! I’m liking the sound of this soup a lot. I bet it’s super tasty and I always like a good spicy kick! 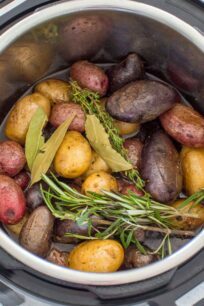 I don’t have an instant pot, but I am still going to give this a try. We love stuffed peppers! This looks so good. I’m going to have to get the ingredients so I can make it. It’s been so cold and rainy here. This would be perfect. This soup looks amazing! I love stuffed peppers and the sounds of it as a soup just makes me want to make it. 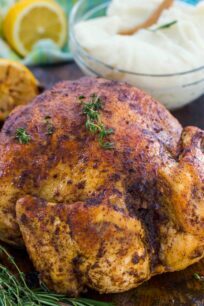 I don’t have an instant pot, but I love your recipe! It looks sooo good! Oh my gosh, this soup looks absolutely delicious. I need to start using my Instant Pot more. My Instant Pot is still in its box. I need to take it out and get some courage to make this! Looks good! Looks like an easy recipe for tomorrow’s breakfast. Will save this for tomorrow! I’m a huge soup lover and if it takes only 30 minutes to make I love it even more. Can’t wait to give it a try.